Is Pilates Just an Exercise Routine?? Pilates is more than a workout. It is a discipline & as Joe’s quote states, everyone has the ability to find it within themselves. When you practice Pilates you learn discipline. One item is learning to move properly. You want to learn Pilates so well, that when you are not at the studio practicing it, you still know how to move safely. The whole point of that is learning that you have within you what you need. You just have to find it and unfold it. Your vitality, power & health comes from within you. Stop looking outside to external fixes. Stop, breathe & look within. You will notice you have everything you need. 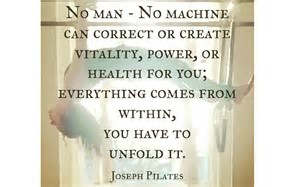 I look forward to seeing you at Witt Pilates. New clients get 1 week FREE! Pilates, Is It Really For Me?